Most of you know that Coach Don McCauley is going through a tough time right now. He’s been diagnosed with congestive heart failure and now Stage IV brain cancer. He just had a tumor removed that was causing stroke-like symptoms, and that has relieved a lot of symptoms causing him the most grief. Right now we have Coach Mac in full effect, but we still have a battle in front of us. This article isn’t about his cancer or heart disease. However, if you want to help support his cause during this tough time, you can donate to coach Don’s GoFundMe campaign. Obviously we would appreciate any help, but this article is about Coach McCauley as a coach and man. Most of you will never know him like I do. You get a glimpse of him maybe on Facebook when he’s pissed off about weightlifting technique or politics. Some of you form opinions based on those rants you read. If you are one of those people, you are missing the boat on this man. Yes, by all means, Don can be feisty on social media, and some of you might not take his side on some topics. However, let me share the side that you don’t see. This man has given his whole life to this sport and his athletes. I believe that he will make it to the Olympics simply because he loves Nathan Damron so dang much. While most of you are watching television or going on a walk, he’s sitting around in his house thinking about the technique of each of his lifters. Look, I am not knocking all of you for relaxing. I am just exalting this man for his desire to make his lifters better. How do I know? I know because I roomed with him on trips during our time at MuscleDriver USA, and he would be awake at 3:00 AM looking at videos. I would always yell at him to get some rest. I knew within minutes of beginning my tenure at MDUSA that I wanted to absorb every ounce of information this man contained. He’s done what other coaches have only dreamed of – such as coaching an Olympian, Cheryl Haworth. He also coached an Olympic alternate, Suzanne, who was his wife. Yes, he might not be good at choosing wives, but the man can coach. The skill he possesses that impressed me the most was his ability to see the movement with his naked eye. He knows right away what’s causing a lifter’s problems, and he knows how to fix it. Heck, he can hear an imperfection better than most coaches can see it. Sounds crazy, right? I’ve been there when he heard a lift behind him, and he knew exactly what had happened. Some of that comes with experience, but a whole lot of that is a raw talent most of us will never have. I want to write a series of these articles so the world can know the Coach McCauley his team members have known for years. Don and I were together this weekend watching two of our athletes get married – Jacky Bigger and Bryan Simeone. He and I had a few glasses of wine and started sharing some of our memories together as coaches. 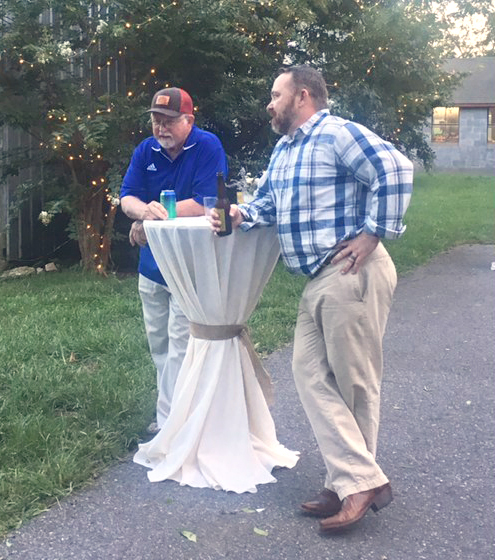 At the wedding, we had multiple generations of athletes gathered, like Becca Gerdon, who was my first weightlifting athlete – one I later sent to MDUSA before I was ever there. We both love that girl, so we started talking about her movement on the platform and more importantly the incredible demeanor she brought to practice everyday. This led us to talking about Jacky, and that led to Hunter, then to Nathan, then to Morgan, then to Ryan, and on and on. It was in that moment I realized the world has to know about Coach McCauley for who he really is – not for Facebook or (heaven forbid) GoHeavy. In each of these articles, I am going to highlight something he’s taught me, one or two of his thoughts he’s posting on Facebook, and maybe a few funny stories along the way. If you love weightlifting or the barbell in general, you will learn a thing or two I promise. So let’s get started. It’s all about timing. Everyone wants to talk about the pull as it pertains to height and power production, but no one is talking about the real trait that separates the great lifters from all the rest – and that’s timing. He first pointed it out to me at MDUSA as we were watching James Tatum. James always baffled me. Yes, he looked athletic, but he didn’t look capable of snatching 160 kilograms. Yet he snatched 160kg while competing in the 77kg class. Was it his speed? He’s fast, but there are plenty people faster. Was it his power production? He’s powerful, but I’ve seen people with way more power. Was it his absolute strength? He’s strong, but Travis Cooper was stronger. Was it his mobility? No way, he’s actually a bit tight. So what was it? His timing was absolutely perfect. By timing, I mean his ability to waste zero time at the top of a pull before ripping under the bar. You can watch Yury Vardanyan and Kakhi Kakhiashvili to see two masters of timing. This is where Don and I differ the most from most coaches. While they are focusing on jump and shrug (which I am not hating on at all), we are focusing on shrugging down the moment the hips extend at the top. Once the bar leaves the hips, its trajectory is already set. There is nothing extra you can do to make it go a bit higher. Any delay will be detrimental to you being able to get underneath the bar. Ever since he pointed this out to me, I’ve noticed this trait with most great lifters. Nathan Damron, for example, is getting better with this each and every day. Everyone talks about his strength, but it’s his speed and timing that will win it for him. Luckily we have veterans who are almost perfect with timing to demonstrate for our younger generation. It’s this timing factor that allows people who are simply good at the sport to dominate other athletes who are superior in strength and athleticism. Pete Kelly is a great example of this. Pete is an Olympian from 1996. He isn’t incredibly strong in squatting or pulling. He isn’t incredibly explosive. However, he could outperform everyone else because he was simply better at the sport. It’s timing and technique that makes one better at weightlifting. You can see more of these on Don’s Facebook account. I am planning something kind of cool with all of these McCauley quotes. I hope you guys enjoyed this. Let me know if there are specific questions you have for Don. If I don’t have the answer, I will get it from him. Once again, if you want to support the old man, we’d appreciate that. You can always support his nonprofit weightlifting team as well. We are in the crucial time before the 2020 Olympics, and we need all the help you can give us. We’ve had a few of our sponsors come up short lately, and that can be pretty devastating for a nonprofit with a small budget as is. This coupled with Coach McCauley’s illness has really laid a beating to us. If you’d like to give to either, we would be grateful. And just in case you missed it before, check out this interview we had with Coach Don before he went in for surgery. This will give you a good picture of the man who loves the sport like none other.